In this presentation, Isabel Martinez places the recent experiences of unaccompanied minors migrating from Central America to the United States in a historical context, describing her family’s own youth migration story which begins in Mexico, 1902. She goes on to explore some of the reasons for the recent surge in Latin American youth migration, including increased poverty, violence, and economic instability associated with the North American Free Trade Agreement and the Dominican Republic-Central American Free Trade Agreement, the United States’ “crimigration” policies, and the kinds of media attention these groups of young people receive. 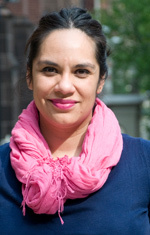 Professor Martinez discusses the many dangers they confront, detailing the experiences of unaccompanied children as young as seven years old, as well as the challenges of being apprehended and the risks of going undetected. She then presents several strategies for teaching this material to students.